What happens when the exquisite artistry of age-old Italian metalwork meets the most valuable gemstone discovery of the 20th century? A true work of art. A work of art we call the Moderno Byzantine Collection. The classic Byzantine chain pattern has stood the test of time for over 2,500 years. And, it’s no secret that Arezzo, Italy is the epicenter of the best Byzantine metalworking on earth. Which is why we sought out one the best artisans to ever melt precious metals to create this collection. Each piece is meticulously made by hand from pure sterling silver and celebrates the traditional woven Byzantine design. 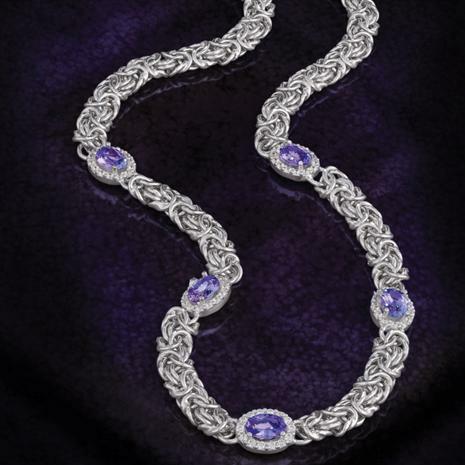 But here’s what sets this collection apart: it features the unique beauty of tanzanite–– a gemstone so rare it is only found one place on earth–– in the remote Merelani Hills in the shadow of Mt. Kilimanjaro. Tanzanite is no ordinary gemstone. Henry Platt, president and chairman of Tiffany & Company called Tanzanite, “The most important gemstone discovery in over 2,000 years.” Put this beauty with pure sterling silver and you have a modern day artifact. High-end design should not carry a high price just because it comes from a big name retailer–– where you’ll find a similar necklace going for four times as much. We prefer to keep our costs low so we can bring you the very best in Italian design at a cutting edge price.